Go where your customers are nearly anywhere on Earth. Create geofences at events, airports/hotels, or even around your competitors. Target users based on their demographics, hobbies and interests. Want to reach sports lovers? Local News Apps? Travel enthusiasts? Music lovers under 25? We can do that. You have total control over when your ads appear. You can select specific dates and times of day for maximum effectiveness. We ensure you're getting the most bang for your buck with continual monitoring and pacing so you don't over or under spend for your budget. We support a variety of calls-to-action including: Click-to-Call, Click-to-Download, Map-to-Directions, Coupon Downloads, Watch Video, and more. Our full-service reports are completely customizable and provide all of the data and insights about your campaign results. We also provide insights and recommendations for future campaigns. Campaigns Up & Running within 5 Business Days or Less! Choose the locations - down to 100 meters - where you want your ads to appear. Our geofencing technology allows us to run multiple ads to multiple locations, giving you total control over your campaign. 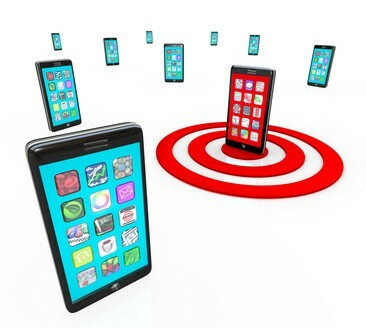 Our inventory includes access to thousands of apps, websites, and ad networks. We leverage a variety of creative sizes in order to take advantage of the available inventory and place your ad on the most popular apps/sites. Every report we send includes total impressions, clicks, and average click-thru-rate (CTR). We can also customize reports to provide even more details, such as actions by ad size, and suggested recommendations for future campaigns. Quick links – Details on Geofencing – Case Studies – Why Us? Thumbvista uses top mobile banner ad publishers and a unique geo-targeting solution to place your ads in the most relevant places. Our clients span a variety of industries including: Retail, Food Service, Travel & Hospitality, Healthcare/Medical/Pharma, Conferences & Events, Tech, Auto, and more. 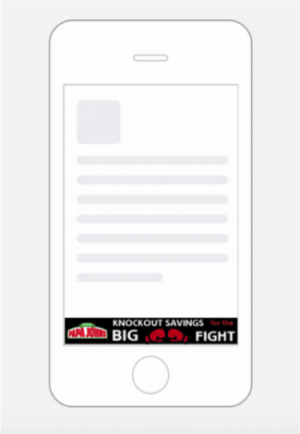 Our mobile banner ads appear on smartphones for iOS and Android operating systems. Our geofencing capabilities can be scaled down to 100 meters for laser-focused targeting. We focus on results, so whether you’re trying to attract customers in-store, driving brand awareness, or engage attendees at a conference, we can come up with a strategy that meets your goals. We also provide full campaign reporting to give you the data and insights you need to measure success and optimize future campaigns. Interested in learning more? Please click the button below or visit our case studies area for ideas for your next campaign. We’re always excited to speak about strategy and any brainstorming services about how to make your mobile banner ads more effective are no extra charge.